Fresh fruit—the healthy and tasty anytime snack for the whole family—is just as popular now as it was years ago. Maybe even more so, as we are all encouraged to increase our intake of fruits and vegetables! A fresh bowl of fruit on the counter is not only a beautiful centerpiece but can also entice everyone to make healthier choices throughout the day. Ideally, we need to make these fresh snacks easily accessible, but keeping the contents of a fruit bowl fresh is another matter entirely. Using a bowl that is attractive will add to the beauty of the fruit bowl, but it is important that the bowl itself is functional when it comes to helping keep the fruit fresh. Any fruit bowl can be a vessel for fresh fruit, but the styles that permit better air circulation all around, including under the fruit, can help maintain freshness. It is better to choose a ceramic or, preferably, a wire mesh bowl; plastic or metal non-mesh bowls tend to make the fruit sweat which can speed up the deterioration process. It is also wise not to choose a large bowl that looks best filled with lots of fruit as it will be difficult to manage. You also want to remember to change out or wash the fruit bowl (just the bowl, and not all of the fruit along with it) at least once a week—or more often if needed—to reduce the presence of fruit flies and lower the risk of bacteria and molds that could negatively affect the fruit. Cleaning a bowl more than once a week may be necessary for ones that do not allow for good ventilation. Make sure you dry it well, however, or the moisture will lead to the fruit deteriorating much faster! It doesn't take much for a smear of rotting fruit on a dish to infect the rest of the contents. When filling the fruit bowl, keep in mind that less is better; the more crowded the fruit, the less room there is for air to circulate around each piece (which can lead to rotting). Also, make sure to refresh the selection often—this will be easier and more natural if you don't overcrowd the bowl to begin with. You should monitor the contents daily. Some fruit varieties decay more quickly than others and this can affect the remaining fruit in the bowl. Remove and replace decaying fruit to keep the bowl content as fresh as possible. 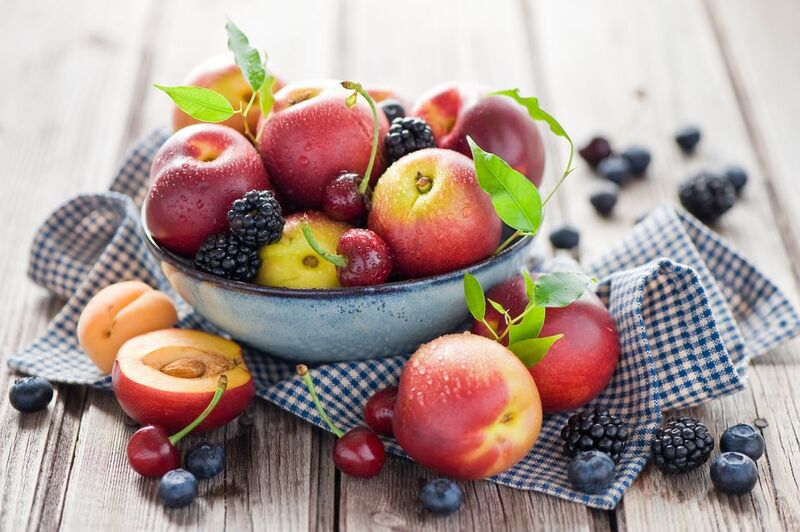 Washing fruit before placing in a bowl can often start the decaying process, so only wash the piece of fruit right before eating (and make sure to instruct all family members of this as well). First and foremost, place your fruit bowl in a visible and easy-to-reach location—don't hide it on a cluttered part of the counter! This way, all family members will be reminded to have a healthy snack whenever they enter the kitchen. To extend the shelf life of the fruit, you may want to refrigerate your fruit bowl at night. Why leave fresh fruit out at room temperature when everyone is sleeping? Keeping the fruit cool overnight will help it to last longer. In warm climates where kitchens are considerably above comfortable room temperatures, you may have to keep the bowl refrigerated for longer periods. In other words, only take it out of the fridge when it's close to snack time or the kids are just getting home from school. If your kitchen is too warm or fruit waste increases, keep the filled bowl on a front-and-center shelf in the refrigerator. It should be the first thing they spot when family members open the door to browse. As the saying goes, we eat with our eyes first. Fruit variety is key, offering various colors and shapes—as well as tastes—to satisfy everyone in the household. But some types of fruit need closer monitoring, such as berries which will decay more quickly than, say, an orange. It's also important to keep in mind that certain fruits such as bananas, apples, pears, and kiwi release a gas that speeds up the ripening process, so including these in your fruit bowl can lead to other fruits rotting quicker. It is also a good idea to think outside the traditional fruit bowl selection to keep things interesting! Including a lemon may encourage the kids to add slices to their water glasses, and can help encourage hydration. An assortment of small cracker packages or nuts mixed in with fruit can also be a welcome treat (if no one who will be potentially partaking has a gluten or nut allergy, that is). If you find that the fresh fruit bowl just isn't working out—maybe it's too warm and the fruit decays too quickly—consider a covered container of dehydrated fruit or nuts to provide alternative healthy snacks (with easier upkeep) for the whole family to enjoy! Your Dishes Are Only as Good as the Garlic You Use...Are You Storing It Right?